Try a Grip n’ Sip Cup for free! Try for free a Grip n’ Sip Cup from NUBY! 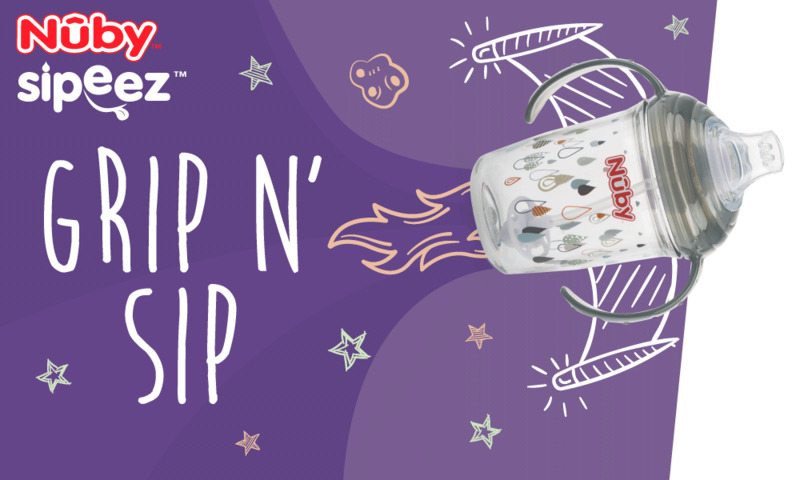 Try the Sipeez Grip N’ Sip Cup, the new out-of-this-world transition cup from NUBY! Is the transition from bottle to cup starting to feel like going to the moon? Sure, it can be hard but that’s why we’ve created Sipeez Grip N’ Sip, an easy transition cup, available here on planet earth. The SoftFlex™ silicone spout with TouchFlo™ valve opens with gentle lip pressure, making it super easy to drink and it’s kind to baby’s gums and emerging teeth. It’s a no-spill, easy grip, dentist-approved* solution to make sure the transition doesn’t feel like going to the moon. No wonder it’s mums and dad’s favourite transition cup everywhere. They come in a range of out-of-this-world colours – grey raindrops, aqua dinosaurs, pink flowers.